PowerPath Monitor > Group/Host view lists all the PowerPath hosts under corresponding groups. Physical PowerPath hosts are organized under their corresponding user-defined host groups (created from the inventory tab) and ESXi hosts are grouped under the corresponding vCenter to which they belong. PowerPath Monitor > Group/Host > Summary view Provides host monitoring capabilities including device/path monitoring. The monitor displays PowerPath volume, path, and bus details. PowerPath Monitor > Group/Host > LUN view similar to PowerPath Viewer, LUN view adds Queued IO value displayed under LUN view, (not available with PowerPath Viewer). PowerPath Monitor > Group/Host > BUS view shows the association between HBA Ports > Array > Array Ports along with the IOs queued for the bus. EMC PowerPath Virtual Appliance capabilities available as a plug-in for VMware vCenter: PowerPath Virtual Appliance supports script plugins on vSphere vCenter 5.5 and above (only vCenter Web Client is supported). vCenter plugin provides a minimal view of the PowerPath Virtual Appliance GUI. The script plugin is registered and enabled on the vCenter server. It can be accessed via the short cut “EMC PowerPath/VE License Manager” in vCenter web client. Only the details of ESXi hosts belonging to the current instance of vCenter are displayed. Access the plugin after registering and enabling it. Use the short-cut, EMC PowerPath/VE License Manager, located in the vCenter Web client. If you use the default self-signed certificate of Virtual Appliance, open the PowerPath Virtual Appliance GUI in a new tab in order to accept the certificate before accessing plugin via the vCenter web client. 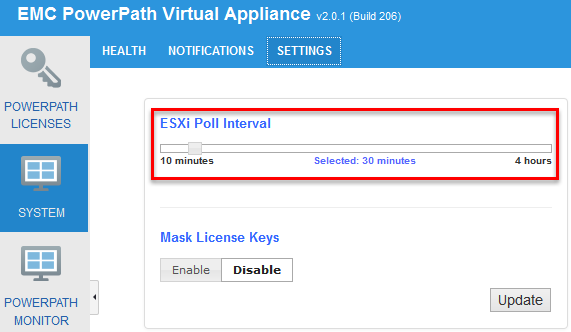 Minimum configurable polling interval for PowerPath/VE changed to 10 minutes. Added polling capability for PowerPath/VE 6.0 and later hosts – based on events. Direct upgrade support from EMC PowerPath Virtual Appliance 2.0.0. See EMC PowerPath Virtual Appliance Upgrade from 1.2.x -> 2.0.0 and 2.0.0 to 2.0.1 for details. Enhanced back-up and restore capability of EMC PowerPath Virtual Appliance inventory. The EMC PowerPath Virtual Appliance Installation and Configuration Guide provides more information.